Health equity in Spanish-speaking communities, says Dana Pilla, continues to be a major crisis. It’s a global issue, explains the assistant teaching professor at Rutgers University–Camden, but nonetheless one that is very much close to home, affecting Spanish-speaking people in Camden and the southern New Jersey region. “This is due in part to the fact that many health professionals lack the ability to communicate and interact with this population in their native language, and provide culturally sensitive care,” says the lifelong Cherry Hill resident. The Rutgers–Camden students recently helped to register Spanish-speaking residents who wish to receive donated holiday food baskets and toys. A group of bilingual Rutgers–Camden students is now doing its part to help fill that void. Students in Pilla’s advanced-level “Spanish for Health Professions” course are currently providing bilingual support at the Salvation Army Ray and Joan Kroc Corps Community Center, a large-scale health and wellness facility open to the public in Camden. Pilla, a Rutgers–Camden civic engagement faculty fellow, explains that while many residents in the surrounding community speak Spanish exclusively, the Kroc Center doesn’t have many employees on staff who speak the language. The center recognizes the need, she says, and with limited resources, has been working with her “to bridge that gap” and provide this much-needed assistance. 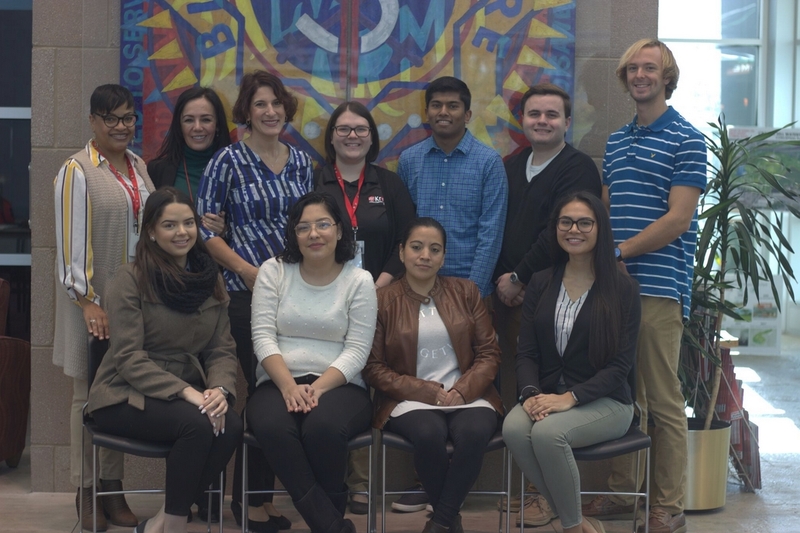 “We spent a year coming up with a game plan for how we can utilize Rutgers–Camden students,” says Pilla, who leads introductory to advanced levels of the Spanish for Health Professions course, designed to prepare students to communicate with, treat, and serve Spanish-speaking persons in a variety of health-care settings. Students in the civic engagement course – all of whom have an advanced level of proficiency in Spanish – have been periodically visiting the Kroc Center as a class, in addition to completing six to eight service hours on their own, to assist as needed with a variety of initiatives. Along the way, says Pilla, the Rutgers–Camden students are finding that developing language skills is more than just finding new meanings; it’s about sharing meaningful experiences. The students have been assisting as needed with a variety of initiatives. The Rutgers–Camden students recently conducted “holiday assistance interviews,” registering Spanish-speaking residents who wish to receive donated holiday food baskets and toys. The students are now creating bilingual recipe cards that utilize ingredients found in the on-site food pantry and fit the U.S. Department of Agriculture’s MyPlate model for healthy eating. The students also plan to visit the center in early December to assist residents shopping in the food pantry. In addition, the students are designing a series of Spanish-language print media – such as posters and flyers – highlighting programs, services, and upcoming events at the center. Pilla credits Rutgers University–Camden for giving her the opportunity to create a curriculum centered on real-life experiences that will not only benefit her students in their prospective careers, but also allow them to see how other people live and, just as importantly, how major, global health issues are affecting those in their own communities. Pilla affirms that the experience offers students a different worldview. Pilla adds that having effective bilingual skills is no longer just an asset for many health professionals; it’s a necessity for anyone entering the field. In addition to taking individual classes, Rutgers students are eligible to complete an internal certificate program in “Spanish for the Health Professions,” which recently won a 2018 American Association of Colleges of Nursing (AACN) Innovations in Professional Nursing Education Award. The program seeks to promote health equity for underserved Latino and immigrant populations by strengthening Spanish language skills among future health-care professionals. The total project amount is supported by a grant awarded to the Rutgers School of Nursing–Camden and accepted by Dean Donna Nickitas from the U.S. Department of Education’s International and Foreign Language Education office. In the spring, Rutgers–Camden will also begin offering a certificate program in “Community Interpreting,” which will enable certificate graduates to be employed at any medical facility in the United States as a qualified medical interpreter.